Admission to a student’s college of choice is one of the core concerns of every family who attends The Grauer School. To address this concern, our college admissions counseling services demonstrate our true strengths, as well as a prime reason why many families seek admission with us. Parents can breath easy: Our faculty and staff are true partners with your family as your children gain independence and navigate the path to college and beyond. Our counseling services are designed to help students determine the best college for their personal and academic goals, and just as importantly, to help them gain acceptance so their goals can become tangible realities. Each student at The Grauer School is part of an enriched path, which includes mastery learning and honors options in all academic areas. Students choose from nearly 150 courses, and will experience humanitarian expeditions around the globe along with an academic profile of distinction. These factors enable most Grauer students to gain acceptance to, and obtain scholarship money from, more colleges than they initially expected. In fact, this is a common occurrence at Grauer! The process begins when students are in 8th grade, with an explanation of how high school transcripts are used by colleges to evaluate applicants. 9th graders are taught how to write a resume that includes leadership, extracurricular activities, awards, and athletics. 10th grade students may choose from at least one college expedition per year until they graduate. 11th grade student write college essays, visit colleges, prepare for college admissions placement testing, and begin the college search. 12th grade students start with College Application Preparation camp in the summer before their senior year, then they work personally with our dedicated college admissions counsellor until the acceptance letters are coming in! We offer college planning nights for parents, and College Application Preparation (CAP) camp in the summer to help students with applications and standardized test preparation. We help students define their interests, and provide college matching — taking into consideration students’ and families’ wishes in terms of field of study, location, size, activities, clubs and extracurriculars, and more. We guide students through internships and summer opportunities that may enhance their success in gaining acceptance. Sure, college rank is the concern of some, but our students find the college of true, best fit — colleges where they will belong and have access to leadership — that’s the Grauer School way. College and career counseling services for high school students at The Grauer School are thorough and comprehensive. Together and over scores of many private and group meetings, our counselors and your child will evaluate his or her learning style, the all-important college essay, choice of major, school size, school setting, distance from home, reputation, and other variables in creating a list of colleges to apply to. We strongly encourage our students to visit campuses they are interested in, and to talk to students who actually attend. Beginning in 10th grade, students may go on at least one college expedition per year. Most Grauer students visit colleges throughout their high school years. We invite you to read our School Profile below, which provides a snapshot overview of the unique features of The Grauer School. This school profile document is used by college representatives to learn about Grauer when one of our students applies to their college, and it is updated annually. Our popular CAP (College Application Preparation) Program is a one-week summer workshop (college application “bootcamp”) in which a Grauer college counselor and English teacher help students understand how to apply for college, and also take the time to help students with their college applications. Throughout our College Application Preparation Program, students will develop an organizational system for keeping track of important dates and deadlines; work on the UC and CSU applications; complete the Common Application; have application essays edited and critiqued; and receive direction in resume writing. Students find this program invaluable as they prepare for their important college admissions obligations, combined with their senior year course work. This program helps students along their path to successful college admissions. We are extremely proud of how our College Application Preparation Program helps prepare students for successful college admissions! If you have any questions about this program, please contact our College Counseling office at counseling@grauerschool.com. 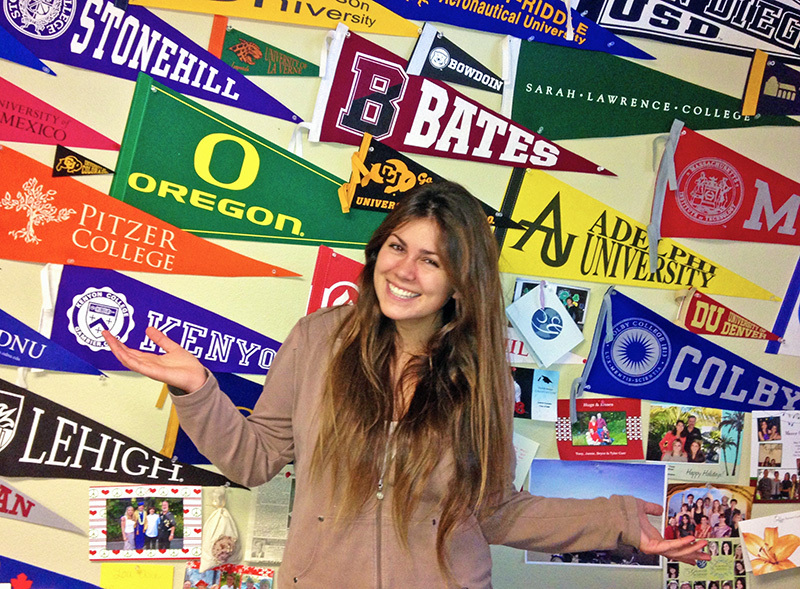 The Grauer School is proud to continually raise the bar as one of the best college prep schools in San Diego for students who seek academic excellence and social leadership in a small school environment — successful in acceptance rates and merit scholarship offers, and the most personalized college search and application process we have ever seen. Since 1991, our six-acre, green campus in Encinitas has been a springboard for deeply engaged, independent, critical thinkers who strive to enact social changes benefitting every human being and ecosystem in our diverse global community.